A rain barrel is a container used to collect and store rainwater from your roof that would otherwise be lost to runoff and diverted to a storm drain or out onto your property. 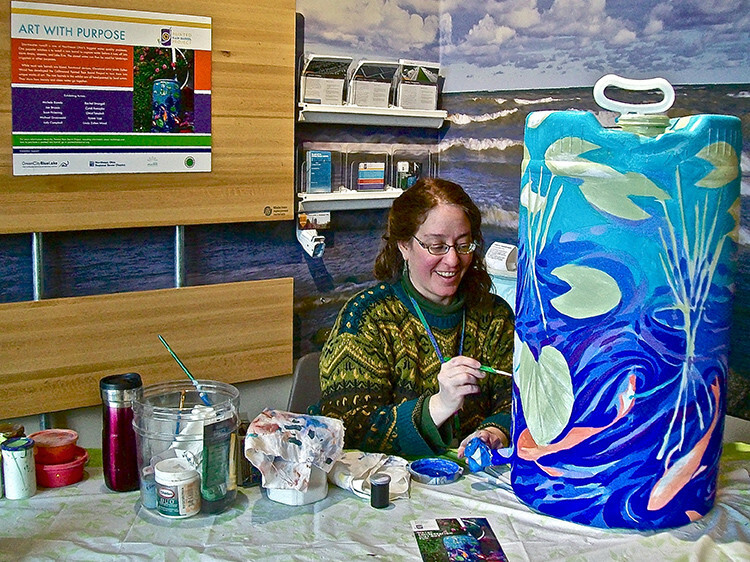 Rain barrels work to keep rainwater out of storm drains and sewers. Why is this important? Every time it rains, unabsorbed water rushes to storm drains and directly into our local waterways. Often times this runoff carries with it pollutants it has picked up along the way. This affects our drinking water supply and limits swimming safety. For every inch of rain that falls on a catchment area of 1,000 square feet, you can expect to collect approximately 600 gallons of rainwater. Students will learn the water cycle and environmental sciences through this program that can be customized as a workshop or residency. Students will design and paint small individual sample rain barrels to take home in the workshop version. The Painted Rain Barrels residency will extend the learning by bringing a standard 55 gallon size rain barrel to the students for the class to paint together. Typical rain barrels are unsightly and do not foster affection for residential use or interest. Youth engagement through art and surface design is more likely to encourage enthusiasm and application through gardening.